Building your brewery…Weldless or welded? A very nice fitting they have is a 1-1/2 tri clamp weldless ferrule that can be used for a drain or heating element. I recommend getting his 52mm socket to tighten it down. The results are impressive. For thinner stainless stockpots I used a Qmax 1-5/8″ punch. They are inexpensive compared to the Greenlee punches. For something thicker like a keggle or heavy duty pot I would use a Greenlee punch or carbide/bi-metal hole saw. Only problem with a hole saw is they can move during drilling, creating a hole that is less than perfect. Again, the successful fiting of weldless fittings depends on how good the hole is. The key to these is proper hole size. Unless specified otherwise the 1/2″ NPT based fittings typically require a 13/16″ diameter hole. Creating this size of hole is relatively easy but will require some drilling. You can use a step drill or a metal punch. The metal punch, such as a Q Max or Greenlee, requires a pilot hole but delivers a perfectly sized hole that is basically burr free. Q.max punches are less expensive and fine for stockpots/thinner kettles. Greenlee punches are more expensive but heavier duty and can punch a hole in a keg but make sure you get the radio chassis 13/16″ punch. They also make a line of conduit punches but the sizes really don’t match the fittings we use. A step drill is the least expensive route and is easy if you take your time. Whenever drilling stainless make sure you use a center punch to mark where you’re going to drill so the drill bit doesn’t “walk” and scratch up your vessel. Use a drilling lubricant such as cutting oil, WD-40 or even dish soap will work in a pinch. Use a slow speed on the drill and plenty of pressure. Resist the desire to go fast, high drill speed will heat up both the drill and the stainless piece. Heat will dull the drill bit and essentially hardens the stainless more than it is already and ultimately brings out the swear words. Take it slow and lube it up. When using a step drill bit make sure to visually look where the appropriately sized step is and stop often, checking the hole size with the fitting you are trying to install. Once the hole is done de-burr it with a little sand paper and/or a round file. A nice smooth burr-free hole won’t tear the silicone washer or o-ring. Install the weldless fitting using the directions provided and you are done. Welding stainless is tricky and best left for the professional. Welding stainless for our purposes requires TIG welding with shielding gas. The shielding gas (Argon) is used to ensure a contaminate free weld. The TIG welder, shielding gas setup, filler rods, electrodes, different sized and types of torch cups can cost you hundreds if not thousands of dollars so finding a professional is the way to go if you wish to have fittings welded. I have done some TIG welding and it is difficult, especially when joining two metals of different thicknesses so I highly recommend finding a professional. Given the training, skill, cost of equipment and consumables as well as just running a business don’t expect to find a good stainless welder that will weld a fitting for $20-$40. If you do keep him to yourself, buy him Christmas and birthday presents…I think you get what I’m getting at. Expect to pay $75-$100 per fitting when done by a professional. Look for welders that specialize in food and beverage industry as they have the experience. Ask to see examples of their stainless work. A good welder will be happy to show you pictures of what they have done or what they are working on. If you are having a fitting welded to a kettle ask them if they will back gas the weld. If they look at you weird then say thank you and leave. Back gassing prevents sugaring of the weld. Below is an example of a poor weld that was not back gassed. While the front weld bead looked pretty good you can see what happened on the backside of the weld. Remember you are not just paying for the welding job you are putting your nice kettle at risk. Here is an example of nice back-gassed weld after a little clean up. One thing that will ensure a good welding job is the fitment of the pieces being welded. The two pieces need to fit together tightly with no gaps. Picture a pipe stuck in a hole that stays in place and requires some force to remove it. That would be proper fitment. I recommend you let the welder drill the hole for the fitting as they know how it needs to fit for them to have a chance at providing you with a great weld job. A more expensive route is sanitary welding that is ground and polished. This route is suitable for fermenters were things have to be uber clean and sanitary with no voids for nasties to hide and ruin your beer. This is left to the most skilled welders and is costly. Below is a triclamp fitting I had installed in a vessel by a welder that specializes in brewery/winery tanks and cost $200 to have done but looks like it came with the vessel. 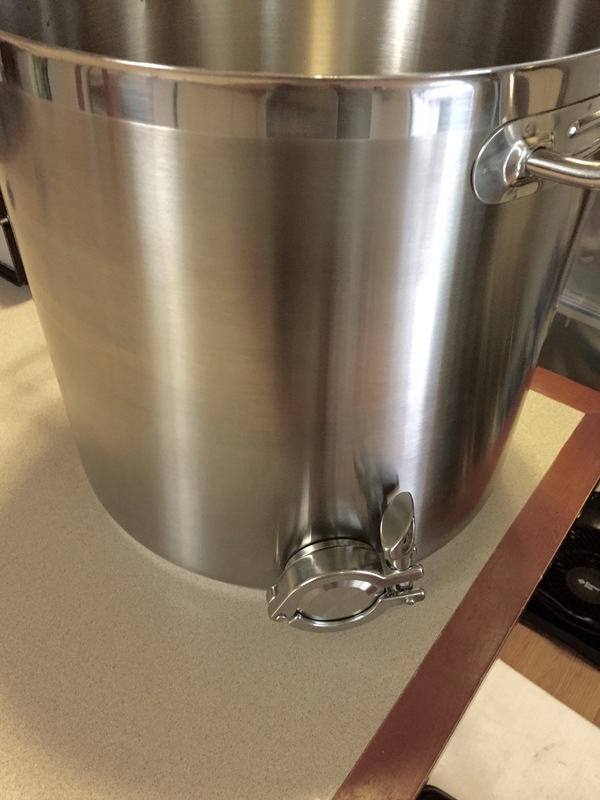 There is good option for the home brewer DIYer that is comparable to welding in finish and strength and requires only a propane or MAPP gas torch. Silver soldering and silver brazing isn’t incredibly hard and can be done at home. I suggest checking out how-to videos and practice on some scrap. Tight fitment is still important. I have practiced silver soldering and just haven’t been pleased with the results but have seen a lot of great silver solder jobs out there. One key step to silver soldering is using the right products and surface prep. The most commonly used silver solder by home brewers is Harris Stay-Brite solder and Stay-Clean flux. The two pieces being soldered must be clean, dirt and oil free and scuffed up a little. I have silver brazed a few pieces and like the results so that is my choice, not much different than soldering just a little higher temperature but still can be accomplished with an inexpensive propane or MAPP gas torch. The thing that makes brazing a little more forgiving is the flux that is coated on the rod, it helps the molten rod flow and bind to the base metal better than the liquid flux used in silver soldering. Only drawback is the cost, the cost of the Harris Safety-Silv 56 flux coated rods is fairly expensive, $50ish or more for three 18″ long 1/16″ diameter rods but they do go a long way, an inch of the rod can do a typical fitting. Same goes for Muggy Weld silver brazing rods at $90+ There are how-to videos online for using flux coated silver brazing rods. Here are a couple examples of pieces I silver brazed at home in a few minutes and with minimal cleanup and polishing. Left one is a 1/2″ triclamp ferrule attached to a stockpot lid and the right is a 1/2″ triclamp ferrule attached to a 1″ triclamp tee. Both were brazed with Harris Safety-Silv 56 rod, tight fit and cleaned with acetone. I hope that helps you with making the decision of how to attach that fitting to your kettle, mash tun or hot liquor tank. With everything else in home brewing, do a little research and ask some questions and you’ll get the result you are looking for.